In ciliates reproduction (B&C) is divorced from sexual recombination (D&E). 'A' is a trophont (feeding stage) cell, 'B' an early stage of cell division with a new mouth developing from an oral primordium (OP), 'C' a newly divided cell- the top cell will swim away to construct a new shell, 'D' two cells in an early stage of conjugation, 'E' a conjugating pair which has formed a cytoplasmic bridge (CB) for the exchange of genetic material. 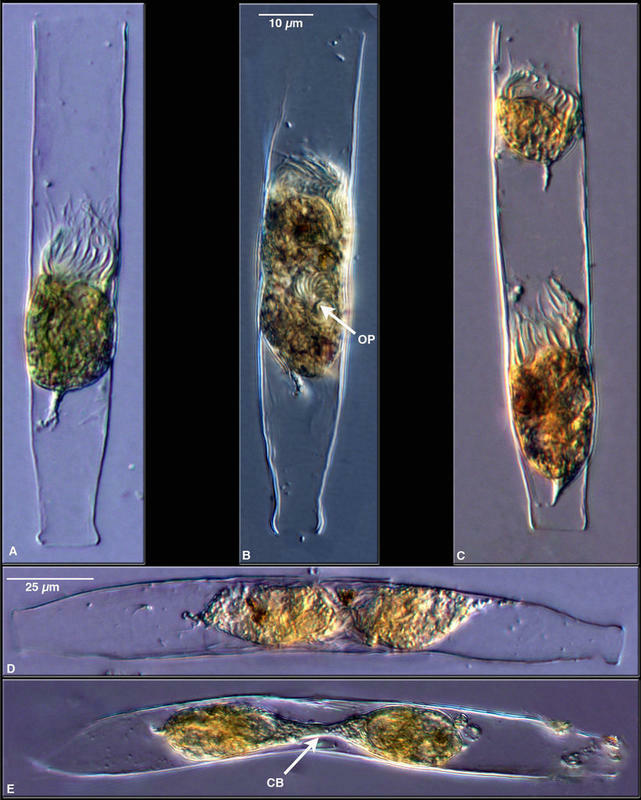 Images of Lugol's-fixed cells from a mixed culture supplied by Fabian Lombard.